Christian Rock .net offers Rock, Hard Rock, Hip Hop & Power Praise Christian Music. 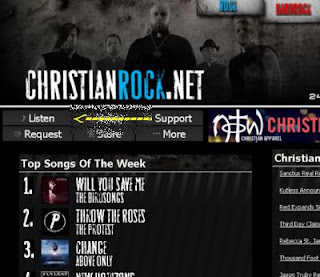 Once you open the link to the web site you will see at the very top of the page the genre of Christian music they offer like the picture below. Look at the buttons that are light blue Red, Green & Pink they list your choices click on the one you wish to listen to.